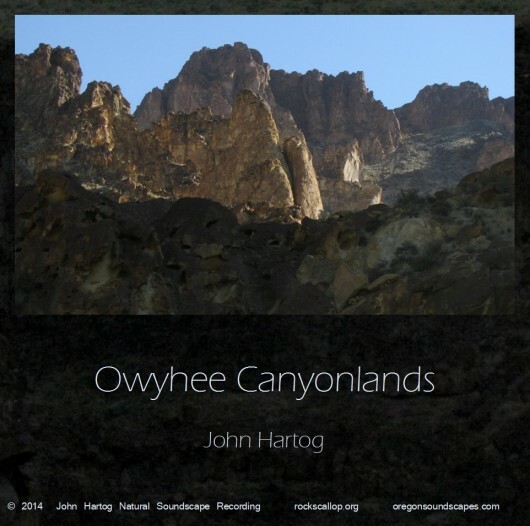 Perhaps the largest and most remote section of undeveloped wildlands remaining of the lower 48 and more than 120 miles of the Owyhee River are designated Wild and Scenic. Yet more than 2 million acres of beautiful wild splendor adjacent to the river and above the canyon walls still await permanent federal protection as Wilderness. Currently available as digital download of high quality MP3, or 16bit WAV or FLAC. Click here to visit the album website or use the player below. 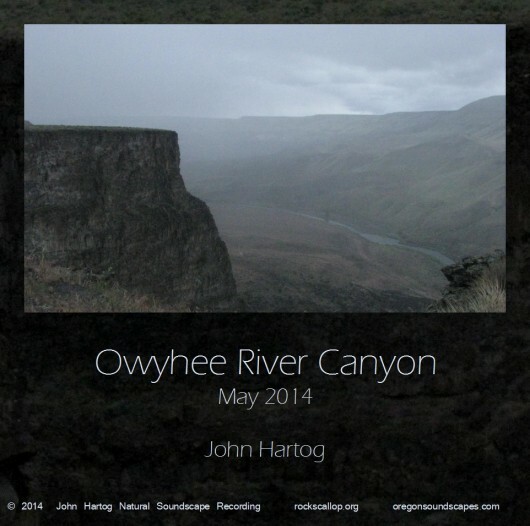 Recorded in high quality digital stereo using specialized soundscape microphones. For best stereo listening experience, use headphones or a conventional speaker arrangement. Extra care was taken with these live recordings to present selections of time with high presence of nature and minimal human-caused sound. Recorded May 10, 2014 in the early afternoon. Track length 10 minutes. From this vantage, the closest river sounds from nearly 800 feet below and the most distant river sounds from miles away are shaped by the winds and canyon echoes before arrival to the listening ear. Cover art- image of Owyhee Riverfrom canyon rim. This selection begins with a gusty breeze and some wind rumble on the microphones, but then the wind quietens revealing bird conversations across the steep terrain. Also listen for the occasional swallows, perhaps bank swallows, swooping past, brewers sparrows, and maybe a rock wren or other bird singing from the steep canyon slopes. This location is in a very remote area of Oregon, perhaps three hours by high clearance vehicle to any services. With very few people or structures for miles around, the primary noise pollution is from commercial jet traffic. The primary natural noise is from wind and weather. When all this settles down, you can hear amazing subtle voices on the landscape. Track 02: Leslie Gulch, September 2010. Recorded September 4, 2010. Very early morning, around 4 a.m. Track length 12 minutes. A quiet soundscape of late night cricket chorus in a desert canyon valley. 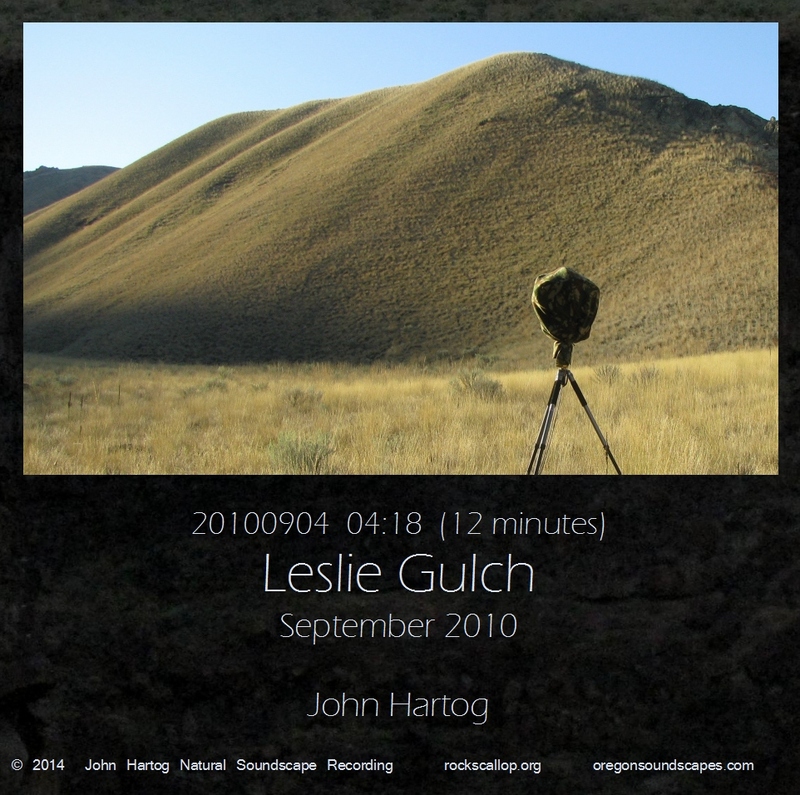 Cover art- image of recording gear on location. In the quietest moments before the morning light, the crickets still sing under a crescent moon, calmed by the cooling of the night. Below towering cliffs, basalt spires, and unique honeycomb formations, Leslie Gulch opens to a grassland valley which eventually leads to the Owyhee River. This recording was taken only a short hike away from the Slocum Creek campground. Copyright 2014, John Hartog, all rights reserved.